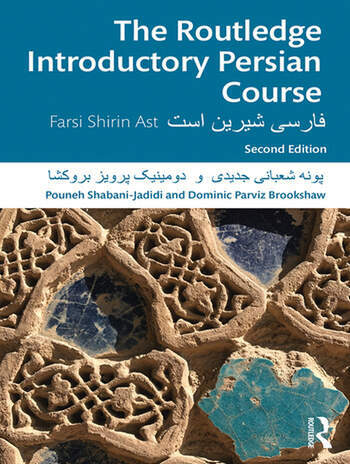 The Routledge Introductory Persian Course: Farsi Shirin Ast is an innovative course designed for students who are new to the language. Focusing on grammatical and communicative competence, the course contains 15 lessons combining dialogues and texts with grammar explanations, exercises and audio materials to guide and support the student through the key skills of reading, writing, speaking and listening. The course provides everything that students and instructors need for an engaging and effective learning environment. Revised and updated, this new edition includes more vocabulary and grammar activities, clearer learning outcomes and an updated comprehensive companion website. Lesson 2 Introduce yourself. Where are you from? Lesson 3 Is Iran or Canada larger? Lesson 4 How many provinces does Iran have? Lesson 5 What do you know about Noruz? Lesson 6 What day is the weekend in Iran? Lesson 7 What is your favourite sport? Lesson 8 Do you haggle? Lesson 9 What do you believe in? Lesson 10 Are women and men equal? Lesson 11 Where is Persepolis? Lesson 12 Is pop music better or traditional music? Lesson 13 What kind of university is your university? Lesson 14 Are you single or married? Lesson 15 Why do you stand on ceremony? Pouneh Shabani Jadidi is Senior Lecturer of Persian Language and Linguistics at the Institute of Islamic Studies, McGill University, Montreal, and is the current President of the American Association of Teachers of Persian (2018-2020). Dominic Parviz Brookshaw is Senior Research Fellow in Persian at Wadham College, Oxford, and Associate Professor of Persian Literature at The Oriental Institute, University of Oxford.